Amy Maxmen lauds a study of the bold project to rescue Owens Lake. 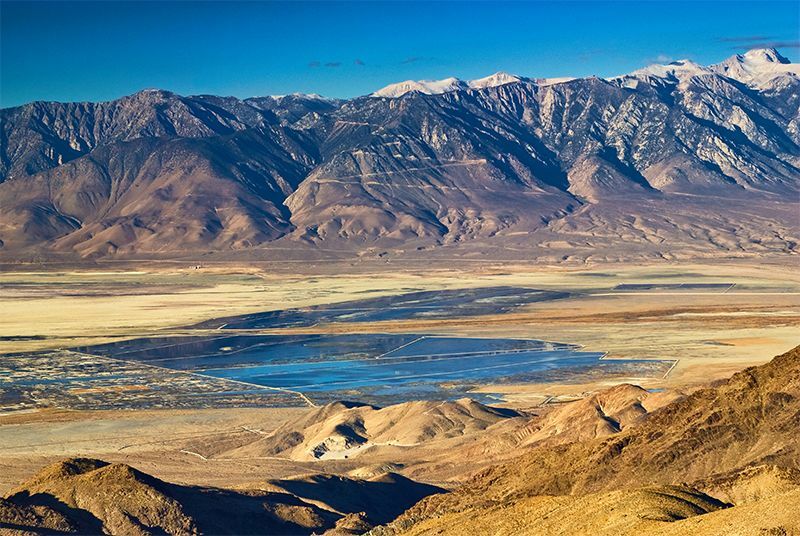 At the start of the twentieth century, Owens Lake in southern California was one of the largest inland bodies of water in the United States. By the mid-1920s, it was gone, drained to provide water to a mushrooming Los Angeles. Over the past 30 years, the city has spent around US$2 billion to undo the damage. It has failed to restore the lake, but in The Spoils of Dust, Alexander Robinson describes how the effort has succeeded in another way: by creating a landscape no less valuable ecologically. By documenting the transitions the lake has undergone, he suggests a way forward for engineers, geologists, ecologists and landscape designers hoping to bring other environments back from the brink. The despoiling of the lake (which was nearly the length of Manhattan, New York) began in 1913. Former president Theodore Roosevelt had ratified a plan for an aqueduct that would divert water from the Sierra Nevada mountains to Los Angeles, instead of the lake. Within two decades, the city’s population had more than quadrupled. By then, the lake bed was dry and the city sought supplies elsewhere. Winds cascading off the mountains swept up storms of dust from the barren land. Sulfate salts eroded clay soils, and toxic particulate matter, including arsenic and cadmium, wafted into the atmosphere. Scientific studies concluded that the dry lake bed was causing itchy throats, burning eyes, asthma and other respiratory problems in the surrounding communities. A mule team hauls pipes during the building of the Los Angeles Aqueduct in 1912.
Credit: Herald-Examiner Coll., L.A. Public Lib. In 1990, this human-made dust bowl prompted the US Congress to amend the 1963 Clean Air Act to include land use, as well as industries, as sources of pollution. At times, the measure of particulate matter at Owens Lake was the highest in the country, at more than 120 times the Environmental Protection Agency’s air-quality limit. The Los Angeles Department of Water and Power decided that the most expedient solution was to refill a large portion of the lake. Unsurprisingly, the plan failed. The land has been altered irrevocably, and only shallow, temporary pools formed along the basin. However, the dust storms did die down, and the city avoided regulatory fines. So it continued to dampen the dust by flooding the area and adding gravel. Initially, the authorities paid little attention to restoring local ecology, but the transformation of the dry lake bed into a heterogeneous expanse dotted with saline pools encouraged the return of wildlife. In 2010, nearly 40,000 native and migrating birds were counted in a single day, including rare western snowy plovers (Charadrius nivosus nivosus). In 2011, the number was closer to 60,000; by 2013, it was up to 115,000. And nearly 5% of the world’s population of American avocets (Recurvirostra americana) were seen at the lake in 2013. Birds have been returning to Owens Lake as the ecosystem changes. The same year, the city proposed putting up to $1 billion into the dust-control project, which now included habitat, cultural resources and economic development among its goals. The new iteration of the project prompted an unprecedented level of data collection. NASA satellites that measure short-wave infrared bands were calibrated with tap tests on the ground to track wetness across the expanse. Geographers used the Global Positioning System to map topographical features. And birdwatchers — professional and amateur — flocked to the site. Intermittent flooding created microhabitats for an enormous diversity of birds: shorebirds, divers and migratory fowl were drawn to various salinities, depths and the particular vegetation or invertebrates in each niche. Throughout The Spoils of Dust, Robinson, a landscape architect at the University of Southern California in Los Angeles, points out that lakes need not be appreciated only as static bodies of water — a dictionary definition. Owens Lake no longer fits that definition; but nor did it 4,000 years ago, when the area was an arid expanse. By revealing the return of life to the site, Robinson invites the reader to appreciate this landscape as a phase in the lake’s progression, rather than see it as a wasteland. After all, to embrace this new environment, the public has to like it. The Los Angeles city government has come around to this view. In the past few years, it has included artists and landscape architects in the restorations of Owens Lake. For example, an open plaza on one side of the expanse is meant to resemble birds’ wings; etchings in a dust-control zone read “Tweet, Tweet” when viewed from above. But Robinson says that this municipal effort, although moving in the right direction, misses the mark. Instead, designers might work with features of the dry lake bed itself in the future — creating visual prompts that help people take pleasure in a huge, managed landscape that comprises pools, sand and mudflats as well as dust-control gravel raked into sinuous curves. To many, it will be much less familiar than, say, a white-sand beach or lake front. A dust cloud over Owens Lake in 2010. And Robinson concedes that amplifying the beauty of such a landscape will not be simple. Unlike people working on many environmental design projects, architects and artists at Owens Lake must balance the aesthetics of the landscape with the need to conserve wildlife and water, and stave off further toxic dust storms. Robinson ends the book with tools that might help landscape architects — and the public — to see the future of Owens Lake as an amenity. Beyond making it non-toxic and ecologically sound, the city could call the project a success if the public champions this reinvented land. To this end, one of the tools Robinson introduces is a robot that rakes sandpits with various designs and connects with 3D-modelling software that renders how the lake bed might look in various scenarios. These parameters can be drawn through the reams of data already collected on factors such as water flow, ecology and cost. To encourage public participation, Robinson has created an arcade-style game in which users explore how changes in design alter dust, water and habitat on the basis of computer models. They then print a postcard from their imagined territory.